Tyrannosaurus Rex is a film Rob Zombie is developing for Dimension Films that is set to release August 2009. However other than concept art, not much has been said on its development. 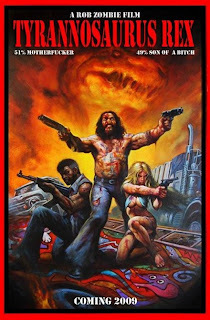 Well the guys over at Shock Till You Drop have some new word on when Rob Zombie will begin shooting the film so he may meet the release date. A source at the Eyegore Awards Ceremony told Shock Till You Drop, "Zombie will most likely begin principal photography in January." The source did however add that he wasn't sure if the August 2009 release date would hold. The source went on to say that the film will be a mix-up of genre's. He added, "Not strictly horror but a film best described as Raging Bull meets The Road Warrior." The only official synopsis available on Tyrannosaurus Rex goes as follows: a mean-motherfuckin'-tough-as-nails ex-wrestler goes up against a legion of lethal bikers, adding further fuel to the fire. Some have said that the film has taken from a comic Zombie wrote called, "The Nail." His co-author, Steve Niles said however, "People seem to be under the impression that Rob is doing The Nail and cutting me out. This is not true. Not only is T-Rex a different story, but also Rob is 100% owner of The Nail and is welcome to cherry pick anything he wants. It's his concept. I was just along for the ride." With a January start date pending, more news is sure to start coming out of the wood work on what exactly the story will entertain. Zombie has never been tight-lipped when it comes to his projects, so I am sure more announcements are soon to come.